Management Aptitude Test has been successfully availed by lakhs of students for MBA and allied programmes across the country. It is the largest test in its category in terms of participation and reach. Research Management Aptitude Test (R-MAT) is a test designed to screen candidates for the AIMA and Aligarh Muslim University joint PhD programme. UGAT screens quality candidates for Undergraduate Programmes such as BBA, BCA, BHM, Integrated MBA, etc which in turn orients the candidates in pursuing MBA or other professional programmes. The All India Management Association (AIMA) was created as an apex body of professional management with active support of the Government of India and Industry in 1957. AIMA is a group- a body to pool management thoughts in the country, a forum to develop a national managerial ethos, an organisation to facilitate the furtherance of the management profession in the country. AIMA has established close linkages with over 3000 institutions and over 30,000 individual professionals directly and through network of the Local Management Associations. AIMA’s activities include Distance management Education, management Development Programmes, National Events, Competitions, Research, Publication and Testing Services. AIMA is represented on a number of policy making bodies of the Government of India and a number of National bodies / organisations. 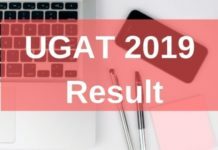 UGAT 2019 Result – Check Here! 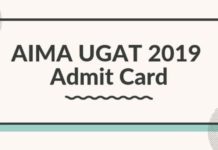 UGAT 2019 Admit Card – Download Here!